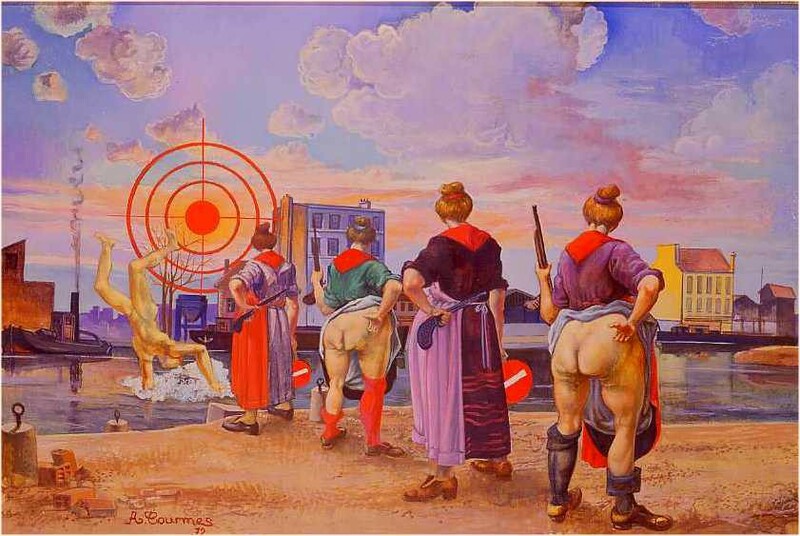 “Four big women more or less identical, one out of two of them with dresses held up showing enormous and monstrous buttocks, seen from the back, the two with their bottoms hidden hold a forbidden access signpost in their back, each one of the four holds a gun in the right hand, all face a wide target with the Saint Martin canal in the background. 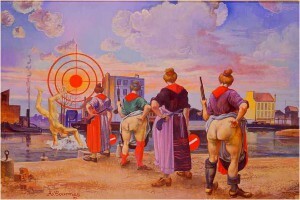 They have shot their guns – the canons are aiming at the sky -, Icarus falls down, badly hit, and get drowned in the canal: multiplied four times, the will of the castrating woman is fulfilled, the male cannot accomplish his love-maker instinct without being punished to death by castrating women …”Michel Onfray, foreword of the book “Alfred Courmes”, by V. Andriveau and G. Bernard, le cherche midi editor, 2003, page 11. 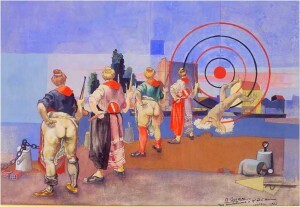 “If one thinks about the birth of Vénus", about the different versions of the "San Sebastian", about “The fall of Icarus”, one could say that I have expressed in a hallucinating, insolent or corrosive manner the themes of great maestros and great prizes of Rome that were painted in a serious way. To those, I will reply that in the past, an artist painter was painting a canvas on order from kings, princes, Popes, clerical associations, and so on …expressing a wish corresponding to their education and culture, who wanted to make their palaces richer and nicer, or their churches… which entailed to envisage only “noble” subjects. 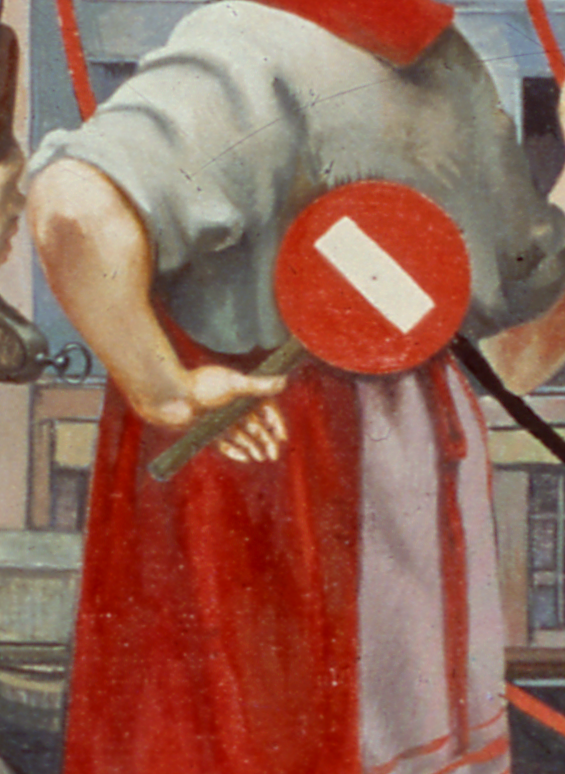 In Greek mythology, Dedale is presented as an inventor and architect; he is considered as the most eminent human among artisans and inventors. 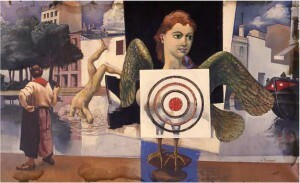 Icarus is the son of Dedale and of a female slave from Crete, Naupacte. Fleeing danger following the death of his nephew Talos, that he had killed by pushing him down from the heights of the Acropolis, jealous of his discoveries that he wanted to be considered as his own, Dedale find asylum in Crete at the court of the king Minos. Pasiphae, wife of the king, ask him to build a cow out of wood, a lure to permit her to copulate with the white bull. This union generates the Minotaur. Minos then orders a labyrinth to be built where to imprison this anomaly of nature. Dedale gave the solution to Arianne, daughter of Minos, to get out of this labyrinth: to unwind a woollen thread that you follow up to the way out. Arianne gave this long thread to Theseus, who used it to get out of the labyrinth after he killed the Minotaur. Having lost the bet he had done with Theseus, Minos imprisons Dedale and his son Icarus in the labyrinth. All this leads to the myth of Dedale and Icarus. This myth says that Dedale had the idea to escape through the air as he could not find his way out without the thread to guide him. He gathered birds feathers and used them to build two pairs of wings, that he fixed with wax to his shoulders and his son’s shoulders. Before flying off, Dedale warned Icarus not to fly too high as the wax could melt with the sun rays. But the impudent Icarus forgot the advice of his father and flew higher and higher. His wings wentoff and he fell in the sea which still holds his name: the Icarian sea Dedale went on his way without problem and landed in Sicily where he was accepted by the king Cocalos. The myth of Dedale and Icarus symbolizes the human desire to go further and further, up to a point where a human has to acknowledges his modest condition. The fall of Icarus can therefore be interpretated as a warning threatening those who abuse of outrageousness and excessive temerity. - 1964 20th May Salon, from May 16th to June 7th, (N° 41), Paris. 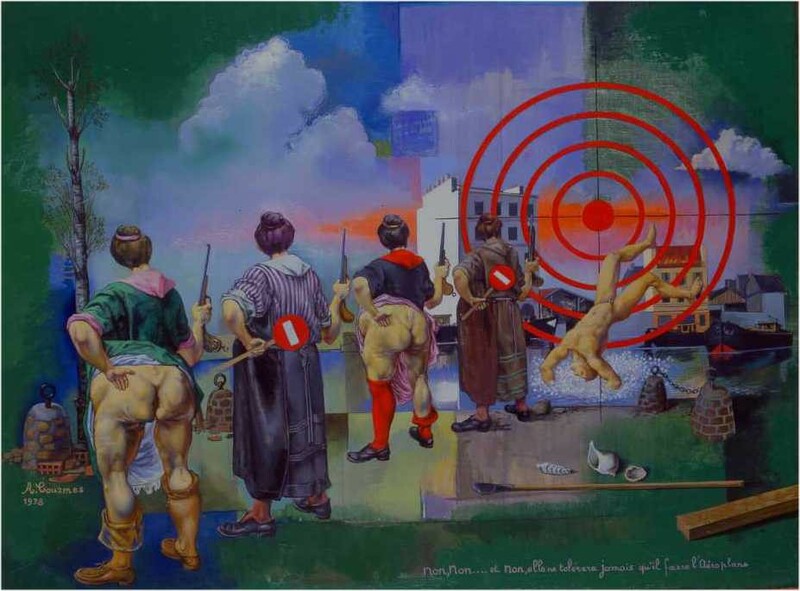 - 1972 “Twelve years of contemporary art in France” (Pompidou Exhibition) National Galleries of Grand Palais, from May 7th to September 18th, Paris. - 1979 Retrospective, Paintings museum, from May 16th to August 20th, Grenoble. - 1989 Retrospective, Sainte Croix museum, from July 3rd to September4th, Poitiers. - 1991 “The ways to fantastic”, Asnières city hall, from October 4th to November 3rd. Photogtraphs by Robert Doisneau, Jacqueline Hyde, Marc Vaux, Eric Losfeld editor, 1973, Pages 85 and 109. - Vitalie Andriveau – Gilles Bernard, Alfred Courmes, foreword by Michel Onfray, Cherche midi editor, 2003, pages 136-137. 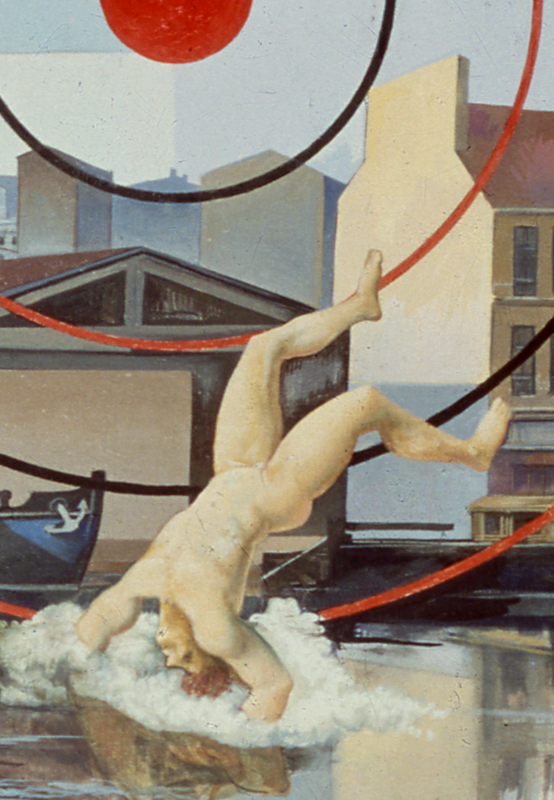 -1979, Retrospective, paintings museum, from May 16th to August 20th, Grenoble, catalogue Page 30. -Jean-Marc Campagne, Alfred Courmes, Prospêcteur de mirages entre ciel et chair, Photographs by Robert Doisneau, Jacqueline Hyde, Marc Vaux, Eric Losfeld editor, 1973, page 58. 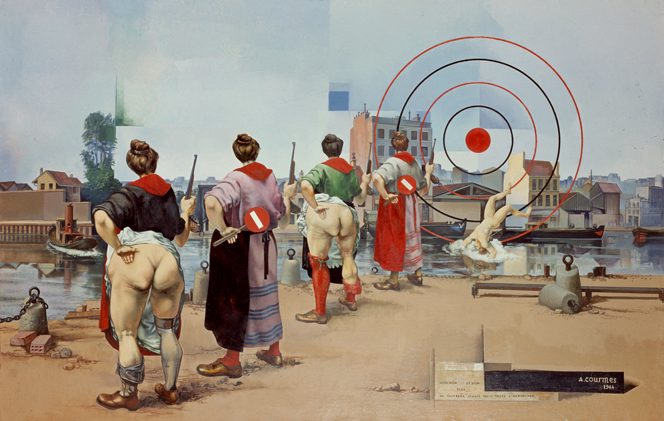 -1979, Retrospective, paintings museum, from May 16th to August 20th, Grenoble.